The INF Treaty, signed in 1987, marked the end of confrontation between the Warsaw Pact and NATO and the beginning of a new security architecture in Europe as part of the process of limiting the offensive capabilities of members of both blocs. Both the U.S. and the USSR fully eliminated ground-launched ballistic and cruise missiles with ranges from 500 to 5,500 km. Among other things, the INF eliminated Soviet RSD-10 Pioneer (SS-20) ballistic missiles, which, with a range up to 5,500 km could reach strategic targets across Eurasia. The Russian Federation, successor to the USSR, honoured the INF limits for more than a decade. However, the elimination of medium and intermediate-range missiles was questioned by the Russian military. In their strategic plans, which still assumed the possibility of conflict with NATO, a huge gap in capabilities emerged, only partially to be filled by tactical weapons. On the one hand, the Russian government gave assurances of its readiness to negotiate further, including in terms of the short-range nuclear arsenal, but on the other hand research continued into new missiles which could succeed those eliminated by the INF. This treaty permitted research but not tests, production or deployment of missiles. Even in the context of growing concerns about the proliferation of intermediate-range missiles in the Middle and Far East (especially the arsenals of Iran and the North Korea), the U.S. was not conducting research on the Russian scale, instead working on the development of various missile defence systems which became contentious in bilateral relations with Russia. At the same time, Russia proposed to the U.S. concept of a “global” INF. This was presented at the United Nations in 2007 but was not supported by countries already advanced in their intermediate-range missile arsenals. Under President Vladimir Putin’s leadership, Russia started to finance research and development of new missiles. By the 1990s, the KBM company had developed the new 9K723 Iskander-M (SS-26) short-range ballistic missile with a range up to 500 km. It was foreseen as successor of the operational-tactical Elbrus (SS-1 Scud) and tactical Tochka (SS-21) missiles. However, before Iskander was deployed and commissioned, the Russian military demanded adaptation of its launcher as a platform for cruise missiles from the Novator company. This solution would expand options and give the opportunity for simultaneous attacks by missiles of different flight paths. Novator was already producing its Klub and Kalibr sea-launched cruise missiles for the Russian navy, so was quickly able to adapt the Klub with a 500 km range as a ground-launched missile. This was adopted by Russian Ground Forces as the 9M728 missile (also designated Iskander-K and R-500 and, by NATO, SSC-7). The first signs of Russia’s readiness to abandon the INF as a limitation on military capabilities against target in Eurasia emerged in 2007. In the same year, Russia suggested the possible transfer of one Iskander missile brigade to Belarus. After the war in Georgia in 2008, decisions were taken about the deep transformation of the Armed Forces of Russia. One element of this was the plan to rearm 10 to 11 missile brigades (12 launchers in each) with the Iskander platform, finished in 2018. In parallel, and along with deployment of the 9M728 cruise missile, Russia has also tested its new 9M729 (SSC-8) missile. This is the ground version of the navy’s Kalibr, with a range up to 2,500 km. In 2014, the U.S. publically accused Russia of violating the INF in this way, which initiated another bilateral debate. Russia demanded that the U.S. reveal and share all intelligence information on the tests of 9M729. The U.S. focused mainly on diplomatic efforts and sanctioning the Novator company. At the same time, many Republicans and some experts recommended stronger U.S. pressure on Russia, including making the New START treaty extension conditional on the INF. Within NATO, issues of the INF were pushed aside, and only at the Brussels summit in 2018 was a final, strong and clearly worded communique issued to Russia, demanding that Moscow honour the treaty obligations. Russia, seeing the lack of a unified position in the U.S. and within NATO, also ignored the American internal debates and demands, as well as some signals from Washington, D.C. that the Trump administration might pull the U.S. out of the INF. Some elements of Russia’s approach to the INF have been consistent since 2014. In military terms, Russia approved the key role of its non-strategic nuclear forces. This is based on the undeclared doctrine that “de-escalatory strikes” will quickly force an enemy to end conflict on Russian political terms. In the propaganda sphere, Russia justifies deployment of its new missiles as a necessary response to the NATO Aegis Ashore missile defence system in Romania and Poland. At the same time, Russia is claiming that container-launchers for SM-3 interceptors in Central Europe will in fact house Tomahawk cruise missiles capable of attacking strategic targets in Russia. This same claim is currently used by Russia against Japan, which is working on its own missile defence system. All these propaganda actions by Russia also provide a foundation for more frequent nuclear threats against countries hosting or building Aegis Ashore systems. Russia will use the expected decision by the U.S. on withdrawal from the INF as an opportunity to deepen divisions within NATO. Russian calculations will take into account the wider context, including preservation of New START after 2021. Russia will blur its responsibility for INF violations and, operating outside the treaty limits, will increase production of 9M729 missiles. That would complicate defence planning for the United States, NATO, Finland and Sweden. The cheapest option for Russia until 2019 would be to expand its arsenal of Iskander brigades with more ballistic and cruise missiles with various warheads, and to boost the capacity of Belarus with 9K723 and 9M728 missiles with conventional warheads. In the medium-term perspective (from 2019 to 2023), Russia might also renew development and research on the RS-26 Rubezh (SS-X-31) ballistic missile with a range up to 5,500 km, until recently declared only as an intercontinental missile. The Rubezh missile might also be adapted and deployed with a hypersonic Avangard-type vehicle. This could give Russia options for penetrating classical missile defence systems and reaching military targets in Europe from bases in Asia, exerting credible political pressure on Western European states. A new missile with a hypersonic vehicle and a range below 5,500 km would not be within the limits of New START or other bilateral treaty limiting the strategic arsenals of Russia and the U.S. However, the Rubezh-Avangard systems would be very expensive to develop, produce, and deploy. The expected U.S. withdrawal from the INF is creating a political challenge for NATO in preserving its unity in the arms control area. After termination of this treaty by the United States, NATO’s efforts should focus on the integration of national missile defence systems in the context of Russia’s growing offensive capabilities. After finalising the Aegis Ashore systems in Romania and Poland (configured against Iranian missiles), another goal for NATO should be integrated missile defence capabilities against all types of Russian missiles launched from the Iskander launcher-platform. This should be based on national air and missile defence systems in Central and Northern Europe. However, in the short term it is not necessary to move quickly on the deployment of existing U.S. cruise missiles (air and sea-launched) to bases in Europe. This step would make it much easier for Russia to use additional divisions within NATO in the context of its additional offensive capabilities. Any decisions by the Allies on new missiles should be conditioned by Russian steps, and by the development of totally new and more advanced U.S. hypersonic and cruise missiles. 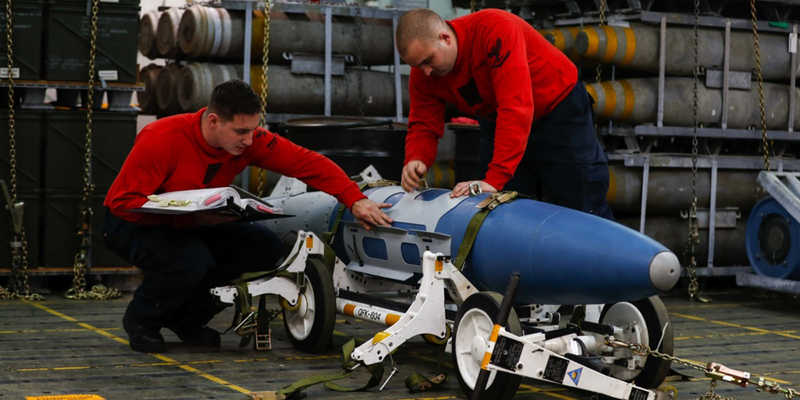 As a temporary step, the U.S. could balance Russia’s intermediate-range arsenal with cruise missiles on air and naval platforms, which are not permanently operating from European NATO countries. In the long term, and in the event that Russia does deploy Rubezh missiles, NATO should create a system able to intercept these weapons. For more information on issues and events that shape our world, please visit the CSS website or browse our resources.